I have people from all over the world and especially the United States reading my blog. 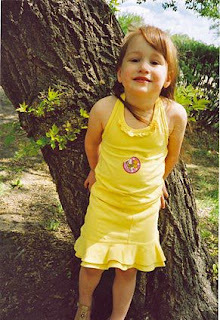 With that in mind, I post this picture of a young girl for whom an Amber Alert (Missing Child Alert) was just issued. I'm not sure where she's from but she could be anywhere. The children's minister from the congregation where I used to serve sent it via email today and when I saw it, my eyes welled up with tears and my stomach turned. How disheartening that someone would harm such an innocent and precious child. I could not imagine someone taking my daughter. Thus, I post this picture to say: If you happen to see this young girl, contact authorities in your area immediately. In the meantime, pray for her, her family and her kidnapper. By God's grace, may she be brought home safely!